The presence of labor unions can have a major impact on a company’s decision where to locate a manufacturing plant. 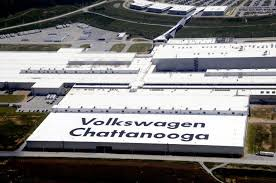 So when workers at the Tennessee VW auto factory voted 712 to 626 last week against joining the United Automobile Workers, it was national news. VW did not oppose unionization, reports The New York Times (Feb. 17, 2014), and seemed to give tacit approval for unionization as a step toward establishing a “works council” at the plant. A works council is a committee, common at German factories, in which white-collar and blue-collar workers elect representatives who establish policies on issues like work hours, vacations and standards for firing workers. But it would be illegal under U.S. law for a company to establish a works council unless workers first voted to have a union represent them. Had a works council been set up at the VW plant, it would have been the first in the U.S.
U.A.W. officials were stunned by the defeat; they had expected to win because VW was not fighting the effort and, just months before, a majority of the plant’s employees had signed cards saying they favored union representation. One industry expert called the loss “a very serious setback for the union, a setback that will resonate throughout the South.” The U.A.W. campaign was clearly hurt by the anti-union sentiment common in the South, as well as an intense campaign by anti-union workers inside the plant who argued that they did not need a union or union dues because VW already treated and paid them well. Wages at the plant average $19.50 an hour. Union officials accused Tennessee Senator Bob Corker of poisoning the atmosphere and preventing a fair election before the vote. Corker had told the media that VW had assured him they would add another production line at the plant (instead of going to Mexico) to make a new SUV if the factory’s workers rejected the union.